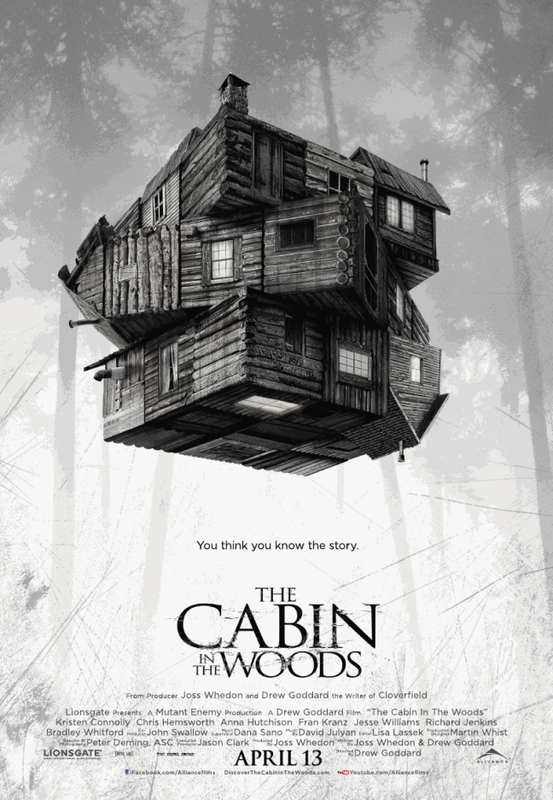 The Cabin in the Woods (2012) is a horror/comedy film written by Joss Whedon. Two gentlemen in an office chat about their wives when a girl approaches them and tells them that the Swedes have failed, and that Japan and the U.S. are the only ones left to accomplish their unnamed task. Meanwhile, two girls prepare for a road trip; Dana has just finished dating her professor while Jules is waiting for her boyfriend. Her boyfriend, Curt, shows up with a date for Dana, and the final member of their group, stoner Marty, arrives. As they set off a man with a radio lets someone know that the group has left. Cabin in the Woods is a genre deconstruction film in the same vein as Shaun of the Dead. There's more structure and less farce, but it does have familiar archetypal characters who end up in a familiar situation. The best part is that the audience knows something else is going on. The Company is revealed to the audience before the teens, allowing the dramatic irony build, though the audience still has to wait for the characters to discover what's going on. Dana is our virgin, well, "We work with what we have." She's a college student who's trying to get over her professor. She's among the last to realize what's really going on in the cabin, but charming enough for the audience and even the company men to root for her. Curt is our jock, a sociology major who also plays football. The character is an interesting spin on the jock trope, though I don't want to spoil too much. Jules is our whore, Curt's girlfriend, and Dana's friend. She gets more flirty as the film progresses, but that's just part of the plan. Holden is our scholar; he's being 'set up' with Dana. He's a nice guy who actually takes the time to impress her before he makes his move. He's quite representative of our cast being likeable and easy to relate to. What a twist! Marty is our fool. He is the first to see that things aren't what they seem. He provides most of the humor as well. He also falls into the wise man archetype that isn't often seen in the horror genre. The Company has a variety of individuals; none of whom are particularly 'evil,' though they take bets on the monsters as well as the kids' deaths. Their apathy is not born from hatred but from over-saturation. These are normal people with a horrible job. The cabin could be strainght out of any cabin horror and especially one of the Evil Dead series. The company structure is plain enough to be just about any warehouse, which provides some of the fun later. The effects aren't bad even though the end does get somewhat effects heavy. The film closes on a monster mash and the reveal of the reason behind the company and the cabin. The semi-twist at the end is almost as good as the final decision the characters make. A great film that bends the genre to ts whims and makes lesser films look ridiculous. Joss Whedon's sharp dialogue moves the story along and helps us like everyone from Dana to the Company intern. This is a must see if you love horror or comedy. Be sure to check out DC's review as well. Next Time: I'm hopping back across the pond.